The Festive Holiday Celebration Continues at The Entertainment Capital of L.A. The arrival of Universal Studios Hollywood’s first “Christmas in the Wizarding World of Harry Potter™” also brings an exciting selection of all-new themed merchandise inviting guests to cherish and share their Harry Potter experience far beyond their visit to The Entertainment Capital of L.A.
​From stockings to stuffers, the addition of these specialty keepsakes and gift-givingitems complement the land’s immersive holiday festivities as the theme park continues to envelope guests in the captivating world of Harry Potter. 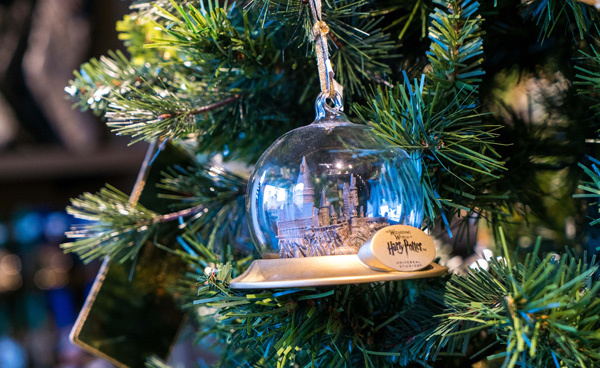 A variety of decorative HogwartsTM castle snow globes, as well as Hogwarts crest and Hogwarts mascot tree ornaments are available in addition to a selection of Christmas stockings, stocking holders and a varietyof unique Hogwarts-themed tree toppers and house pennant garland. Name ornaments will also be available or they can be customized. Items available for purchase are representative of each of the four Hogwarts School of Witchcraft and Wizardry houses.An original Hogwarts Express collection is also available featuring an array of holiday and everyday themed items. From Platform 9 ¾, Hogwarts Railways and Hogwarts Express train ornaments to stockings and holders, as well as themed scarves, hats and gloves to a selection of clothing and collector Hogwarts Express tickets.For guests who prefer to channel their inner Slytherin, Professor Severus Snape’sdramatic full length wizard’s robe makes a grand debut, adding to the selection of existing house robes from the four Hogwarts’ houses: Gryffindor, Ravenclaw, Hufflepuff and Slytherin. For fans of the popular Quidditch sport, a keepsake Gryffindor Quidditch robe scores as a must have and can be paired with either the impressive full size Firebolt or Nimbus 2001 broomsticks as well as select Quidditch accessories, including the coveted Golden Snitch, Quaffle ball and Bludger.Several new interactive namesake wands are added to the collection, including the Cho Chang, Cedric Diggory, Yaxley and a new Death Eater wand. Beginning on November 24, 2017 and continuing through January 7, 2018, the all-new “Christmas in The Wizarding World of Harry Potter” experience will resonate throughout the immersive land this yuletide season transforming the iconic HogwartsTMcastle into a dazzling light projection spectacular, while the quaint town of Hogsmeade village shines brightly with décor uniquely themed to each of the individual storefronts. The a cappella Frog Choir, comprised of Hogwarts students and their giant throaty frogs, will perform all-new seasonal songs. Newly introduced holiday-themed fare and the seasonal return of hot Butterbeer will further complement the overall experience.A special time in the Harry Potter series, the all-new “Christmas in The Wizarding World of Harry Potter” tradition invites guests to celebrate this part of J.K. Rowling’s story for themselves. From its snow-capped roofs and cobblestone streets to the historic Britishsensibilities that characterize the whimsical look and feel of the land, “The Wizarding World of Harry Potter” transports guests of all ages to the very places they watched on the silver screen. “The Wizarding World of Harry Potter” resonates with immense detail, inviting guests to enjoy authentic food and beverages at multiple locations, including Three Broomsticks™ and Hog’s Head pub, as well as the Magic Neep and Butterbeer™ carts. A foray through the shops adds to the authenticity of the land with nine retail venues and locations, including Honeydukes™, Ollivanders™, Owl Post™, Zonko’s™ Joke Shop, Wiseacre’s Wizarding Equipment, Dervish and Banges™, Gladrags Wizardwear, Filch’s Emporium™ of Confiscated Goods and the Hogsmeade™ Station. Additional information on Universal Studios Hollywood is available at UniversalStudiosHollywood.com. Join the conversation online using #UniversalHolidays and #WizardingWorldHollywood. Like Universal Studios Hollywood on Facebook and follow @UniStudios on Instagram and Twitter.Universal Studios Hollywood is The Entertainment Capital of L.A. and includes a full-day, movie-based theme park and Studio Tour. Warner Bros. Entertainment is a global leader in all forms of entertainment and their related businesses across all current and emerging media and platforms. A Time Warner Company, the fully integrated, broad-based studio is home to one of the most successful collections of brands in the world and stands at the forefront of every aspect of the entertainment industry from feature film, television and home entertainment production and worldwide distribution to DVD, digital distribution, animation, comic books, video games, product, and brand licensing, international cinemas and broadcasting.